Successfully Added Hamburger Mini Speaker to your Shopping Cart. The Hamburger Mini Speaker delivers full bass and big, high quality sound from a mini speaker! Are you hungry for good audio? Are you starving for portability and delicious sound at the same time? If so, you're in luck, because we've got a juicy Hamburger Mini Speaker fresh off the grill with your name on it! This small, unassuming speaker truly has to be heard to be believed. The "hamburger" shape is actually cutting-edge technology that endows this pint-sized speaker with beefy bass that makes other mini speakers drool. Your friends will be amazed to see that a speaker that fits in the palm of your hand can fill the room with big sound and full bass. With the Hamburger Mini Speaker, you can have portability AND great audio in one cool device. 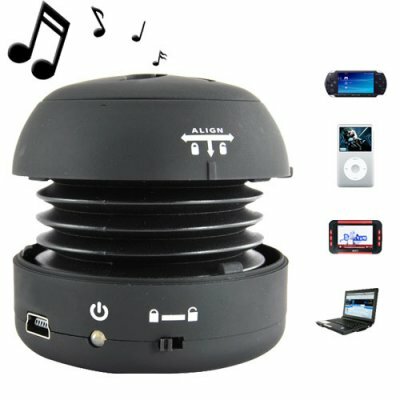 The Hamburger Mini Speaker sounds (and tastes) great with all your portable gadgets that have a 3.5mm audio out jack, including your iPod, PSP, NDS, CVFH-N03, MP3 player, MP4 player, laptop, notebook, netbook, CD player, mobile phone, and PDA. The Hamburger Mini Speaker is great for sharing your tunes while relaxing outside, vacationing at the the beach, driving in the car, hanging out with friends at school or at the mall, or even relaxing at home and in the office. Looking for a tasty item for resale? The Hamburger Mini Speaker is just what the chef ordered. Order a few today to enjoy this mini speaker for yourself and then resell the others on your internet storefront to enjoy this item's profit potential. Then move on to bulk orders for maximizing your resale profits. This amazing gadget is in stock and ready to ship directly to you or your customers from your best source for high quality, low price gadgets, Chinavasion. This item is sold with an MOQ of at least 4 pieces to help save on the per item shipping cost for you. Does the Hamburger Mini Speaker always have to be connected to a USB port? How long does it take to charge the speaker's battery fully? 2.5 hours if you plug it into an AC adapter. 4 hours if you charge it through your computer's USB port. The Hamburger Mini Speaker is definitely loud enough to provide sound for an entire small- to medium-sized room. Un son super et une puissance à vous étonnez.Je le connecte sur mon PC ou mon téléphone ou sur mon MP4,c'est vraiment un très bon produit je le conseille à tous.On peut le transporter facilement vu sa petite taille.Excellent produit merci à Chinavision. Es una maravilla para lo pequeño que es y su sonido de graves es estupendo.No he visto un altavoz tan pequeño que rinda tan bien.Además económico y sorprendente para recomendarlo a todo el mundo.Merece la pena comprar los 4 y creo que màs para hacer un buen regalo. on 2010-02-11 01:31:17 una pasada!! Es una pasada que algo tan pequeño de tanta potencia y muy buena calidad de sonido!! !desde luego es muy practico y sobre todo lo puedes llevar donde quieras porque apenas ocupan sitio.Una vez más por velocidad,calidad y precio GRACIAS/THANKS CHINAVASION!!!! on 2010-01-17 20:42:47 Wicked ! My friend bought it and its loud! The bass is amazing Cant wait for my order t get here! Awesome Sound and fast delivery!! Thank u! !